Using the underground in these three cities is pretty straightforward, with the main question being which ticket to get and how much does it cost? If you and your colleagues occasionally visit one or more of these cities, it might be worth getting a couple of communal cards and extra tickets for the office. If you’re over in Brussels on business and using the metro, you’ll need to buy a MoBIB Basic card and upload trips (called “Jumps”) on it. 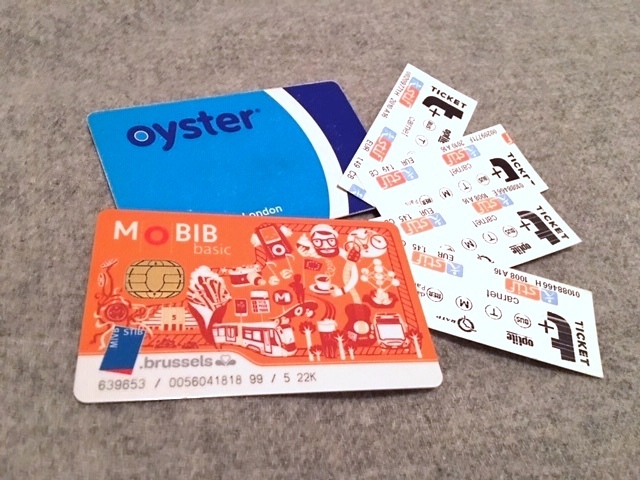 The MoBIB Basic card costs €5 and lasts 5 years. You buy the card from kiosks in the large underground stations and you can recharge with “jumps” as required at ticket machines in all the stations. The MoBIB Basic card means it’s non-personal and can be lent to other people, so worth considering getting one for the office if you have people heading out to Brussels from time to time. You can find out more about MoBIB on its website. For more information on other fares, such as from the airport, visit this website. If you’re visiting London and haven’t heard of the Oyster card, my advice to you is get one. The cost of travelling on London’s metro is cheaper if you use an Oyster card rather than buying a one-off ticket and frankly, even with an Oyster card, it’s not that cheap compared to other EU city metros. You can buy Oyster cards in metro stations and they cost £5 which is refundable. They can be used to travel on bus, Tube, tram, DLR, London Overground, TfL Rail, Emirates Air Line, River Bus services and most National Rail services in London. There’s even an Oyster App which means you can top up your credit on line as well as at ticket machines in the stations. Oyster cards used on a pay-as-you-go basis can be lent to someone else, so again, it may be worth having a communal one in the office if you and your colleagues come over to London occasionally. Your other option is to use a contactless payment card if you have one. If you plan to use your contactless card on a pay-as-you-go basis, you tap in and out using your contactless card (as you would an Oyster) with fares and daily “caps” (see below) subtracted at the same rate as the Oyster. You can find out more about the Oyster card and contactless option on this website. One journey in central London using Oyster/ contactless card usually costs £2.40. You can find details of fares for specific journeys using the tools on this website. You cannot buy a daily ticket on your Oyster card but as you tap in and out, the system will “cap” how much you pay at a certain point. See this table for the caps and costs (so, for example, you will pay a maximum of £6.80 if you travel around the centre of London – zones 1 and 2 – using your Oyster card or contactless payment card). Paris offers the least high-tech option for occasional travel on its metro where you buy actual, physical tickets. You can buy these little tickets from machines at all the underground stations: if you buy 10 tickets (known as a “carnet”) you benefit from a 20% reduction in price. Warning: try to keep them away from your phone and other credit cards as they easily de-magnetise. For more information on fares, visit this website. If you’re travelling from an airport to the centre of Paris (or vice versa), here are your options and costs. Like this article? Then, sign up for my monthly newsletter below! Take a peak at the first newsletter here and find out why it’s called Moxie Rules.